This year, from Milwaukee to Rome and at dozens of other cities across the globe, Harley-Davidson is commemorating 110 years of classic motorcycles and classic good time. 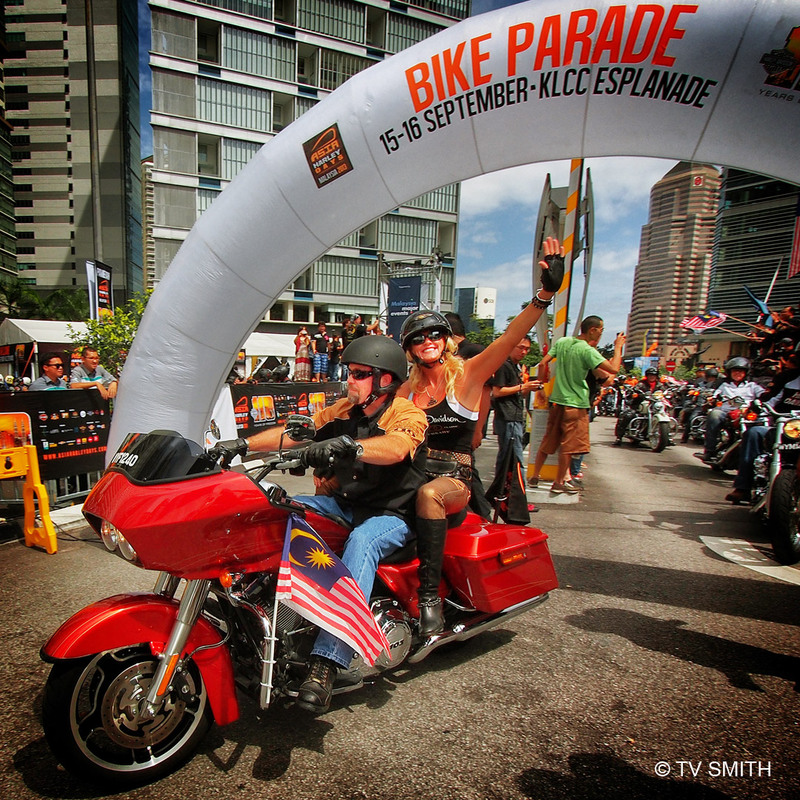 Kuala Lumpur’s Asia Harley Days is South-east Asia’s first and largest Harley-Davidson event with a parade of some 600 Harley-Davidson bikes. Riding a Road Glide Custom, Bill Davidson, the great-grandson of company co-founder, William A. Davidson, led the convoy ride through Kuala Lumpur this morning. Olympus OM-D, ISO 200, f11, 1/400 sec. Harley Owners Group Malaysia Chapter. In the centre, with red scarf, Tan Sri Syed Mohd Yusof Tun Syed Nasir, Chairman of JoJo Events and, in cap, Bill Davidson, the great-grandson of company co-founder, William A. Davidson. Olympus OM-D, ISO 200, f9, 1/200 sec. This entry was posted in Events, Geography, Instagram, Motoring, News & Commentary, Olympus OM-D, Photography and tagged anniversary, asia harley days, bikes, biking, harley, harley davidson motorcycles, harley-davidson, hog, jojo, kuala lumpur, malaysia, milwaukee, motorcycles, motorcycling, olympus, om-d by TV Smith. Bookmark the permalink. You gentlemen made us all feel like VIP’s. You crew were dedicated meticulous amazing. All of you handled it with utmost professionalism. Thank you so very much.